Diamondbacks pitcher Patrick Corbin leads all players in Box-Toppers points for the 2013 season with 14.4 points at the All-Star break. Indians pitcher Justin Masterson, in second place overall with 13.7 points, leads all American League pitchers. Miguel Cabrera of the Tigers, in third place overall with 13.4 points, is leader among AL batters. Paul Goldschmidt of the Diamondbacks is the leader among NL batters with 9.7 points. He ranks 20th among all players. 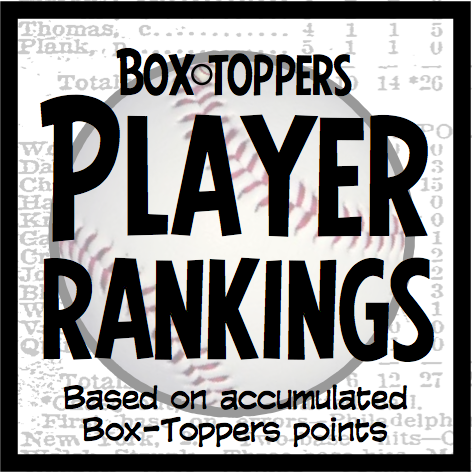 Seventeen players (15 of them pitchers) have accumulated 10.0 or more Box-Toppers points so far this season. Previous player rankings report from July 5.